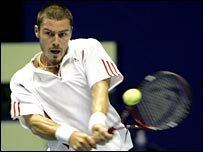 Former world number one Marat Safin continued his slow return to form with a 2-6 6-1 6-4 win over Kevin Kim to reach the Thailand Open second round. The 2000 US Open and 2005 Australian Open winner is on the comeback trail after a bad knee injury last summer. "I have some tough matches coming up," said the Russian, who next faces Julien Benneteau of France. "It's not going to be easy here, but I'm happy with the way I'm moving and how my knee is holding up." Home favourite Paradorn Srichaphan began his latest Thai Open campaign with a 6-1 6-4 victory over Feliciano Lopez. It was the eighth seed's first win over the Spaniard in four attempts. In other matches, US third seed James Blake eased past Marin Cilic of Croatia with a 6-1 6-2 triumph. Finnish fifth seed Jarkko Nieminen dropped the first set but advanced with a 6-7 (6-8) 6-3 6-2 victory against Edgardo Massa of Argentina.